Knight Capital Group is back up and running Thursday, a day after a power outage knocked the company's systems offline. As Wall Street returned to business Wednesday morning, following a two-day hurricane-related shutdown, Knight experienced a backup generator power failure at its headquarters in Jersey City, N.J. The issue affected all equities trading, as well as electronic foreign exchange and electronic fixed income trading. The company, which plays a key role on Wall Street by acting as a middleman in the markets and completing investors' buy and sell orders, stopped accepting new orders just before noon Wednesday, and requested its clients re-route all stock orders to other trading firms. Late Wednesday evening, Knight said it had "resolved the power outages" and that its systems were operating normally. 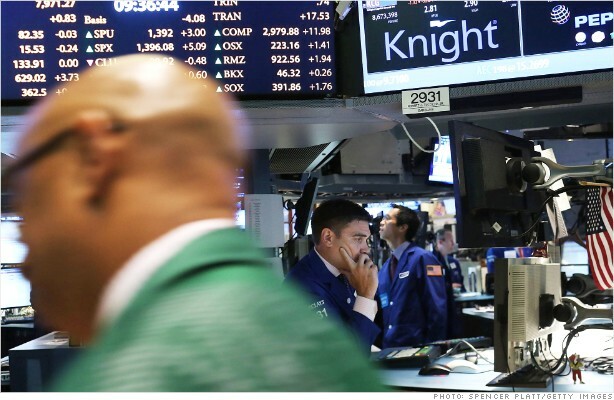 Earlier this year, Knight (KCG) was rescued from bankruptcy after a trading glitch sent numerous erroneous orders in NYSE-listed securities into the market.